My Grandparents both turned 90 this past year. They have been married for 70 wonderful years now, and they are truly meant to be. Grandma can say to Poppop “Hey hun, can you bring me the wha-cha-ma-call-it ?” and Poppop knows exactly what she is talking about. I love them both very much and talk to them on the phone almost every week. The problem is, they live in Florida, and I live in Hawaii. I don’t get to see them nearly as much as I’d like. Travel is a very LONG (and not too fun) event, and unfortunately, they haven’t been back to Hawaii for many years now, as it is just too much for them to be able to travel such a distance anymore. Since they can’t come to Hawaii, I wanted to bring Hawaii to them in some way. I decided to paint “Tropical Z’s”. 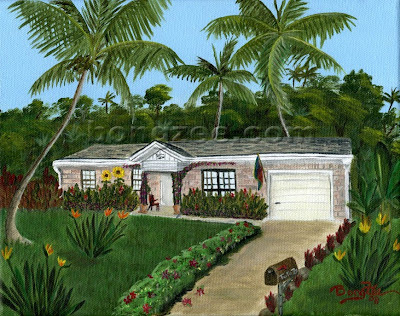 It is a portrait of their home, but placed in a tropical Hawaiian setting. It’s like they are living here in Hawaii with us! It was really fun to paint their house, and add in all the beautiful tropical plants that we find here in the Islands. Coconut palms, Bird~Of~Paradise, Red Ginger, Hibiscus, Ti Leaf, just to name a few. Of course, I did have to leave Grandma’s Sunflowers near the front porch. So, they may not be quite “tropical”, it wouldn’t be Grandma Z’s house without the bright cheery sunflowers that always welcome us to their home! 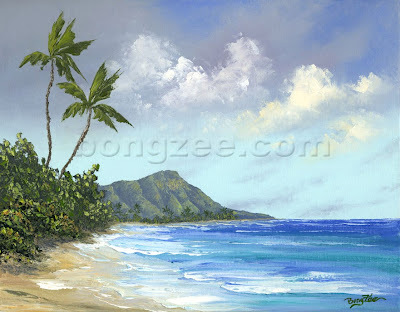 A tropical scene of brilliant blue ocean and a palm lined beach with the world famous landmark, Diamond Head, in the background. Painting is a 16 x 20 Original Oil done with palette knife. 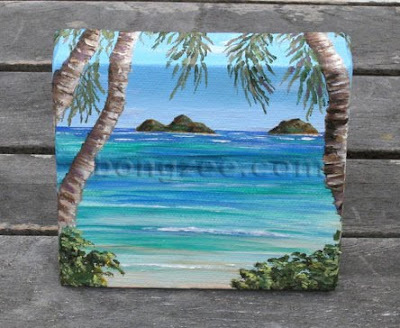 The inspiration for this mini 4x4 painting was a recent visit I took to Lanikai Beach. The scenery is unbelievable, and on a clear, calm Hawaiian day, the Mokulua Islands take your breath away. They seem to just float above the teal turquoise waters of the Pacific. 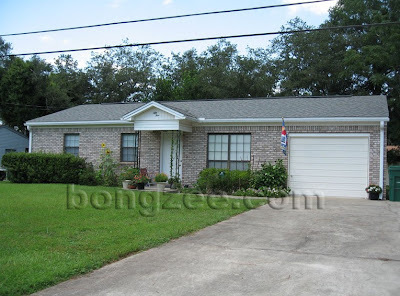 It’s the perfect tropical paradise landscape! 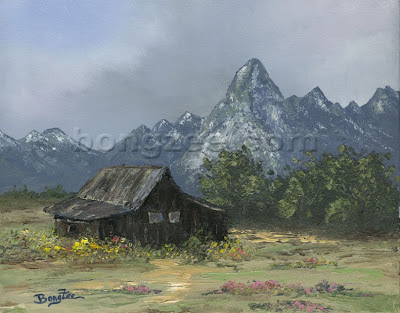 Although this is not one of my typical “tropical style” paintings, we recently visited the Grand Tetons, and I was inspired to paint one of the rustic barns that I had photographed. 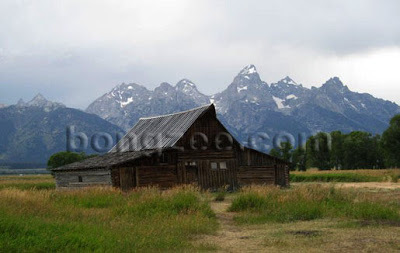 A trip to Grand Teton National Park wouldn’t be complete without a trek down “Mormon Row”. On an old dusty dirt road lie the weathered farm buildings that have withstood the elements for over 100 years. The farmland in this area was homesteaded by predominantly Mormon settlers in the early 1900’s but the land was then purchased by the Rockefellers and given over to the Park Service. The farm homes and barns still stand today as they were over a century ago, and make for wonderful photographs and paintings!! Click Here to read about our Grand Teton Adventure.